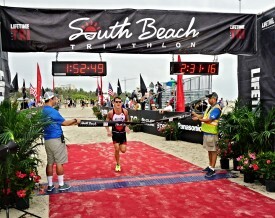 Bill Demchak, Chairman, President and Chief Executive Officer of PNC Financial Services Group, won the CEO Challenge division of the 2016 South Beach Triathlon in convincing fashion, finishing in a time of 2 hrs 27 mins for the 1.5 km-swim, 24-mile bike, and 10 km-run event. Second place went to Michael Hanlon of Advanced Medical Homecare Supplies in PA, and third was Alain Villeneuve of Vedder Price in Chicago. The CEO Challenge weekend included an exclusive Dinner with Ironman World Champion Leanda Cave on Friday night, practice swim and athlete meeting on Saturday, and the race Sunday morning. Race day featured calm water, overcast skies and even some rain on the run course – a perfect day for triathlon!